A-Jump Books, Ithaca, 2006. 96 pp., 49 b&w illustrations, 8½x6¼". The source of the photographs in Alpine Star is the weekly newspaper from the artist's hometown in Central Idaho. The poetic element of these images—that unnamed, abstract subtext found in every photograph—is inflated here through the process of subtle manipulation and nuanced sequencing. 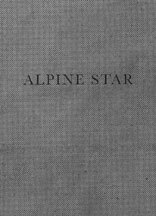 While offering a world of loss and isolation, the pictures in Alpine Star also suggest the cross-pollination of personal history and collective memory.